Huge Update adds New Game Mode, New Story Campaign, New Ship Type, and more! The frantically silly FPS-build-a-gun-bullet-hell Mothergunship releases a new major content update, free for all PC owners. This update brings a slew of new features, a whole new story campaign, and tons of bug fixes, improvements, and balance adjustments! It will be available to console players in the coming weeks. NEW “What’s in a Name?” Campaign: Follow along as the Resistance brings on an unfortunate number of new crew members, discovers a mysterious new threat to humanity, reveals chilling secrets about the Alien Armada, and then fails horribly at giving any of them good names! Unfortunately, we can’t tell you the name of this new playground to fight in or it would spoil a bunch of jokes. Here’s a pretty screenshot of it instead. And…with a new ship…comes a new boss…the intimidatingly good-looking DRAGON TRAIN. Goodluck, soldier! So, maybe basing all our jokes around names was a bad idea. Unlocked by beating the new story campaign, a new way to play Mothergunship awaits you: one filled with challenges that encourage bigger, beefier, weapons! We’ve been listening to our fans and working hard to bring them an experience that everyone can enjoy. Whether this means encouraging you to build larger guns or smoothing out the earlier mission difficulty a bit, we’ve been paying attention and have acted! Looking for more things to kill? 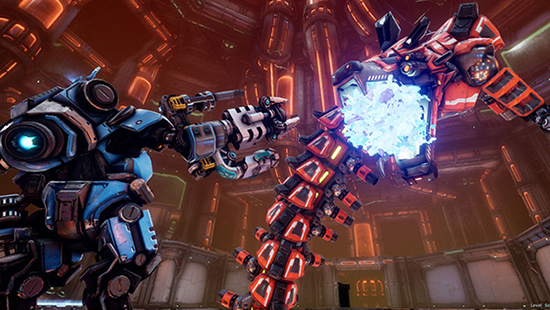 Face off against the Drill Jaw, Electric Hound, Rolling Energy Turret, and the dreaded …uh… Dreadbot. Tired of running out of gun energy? 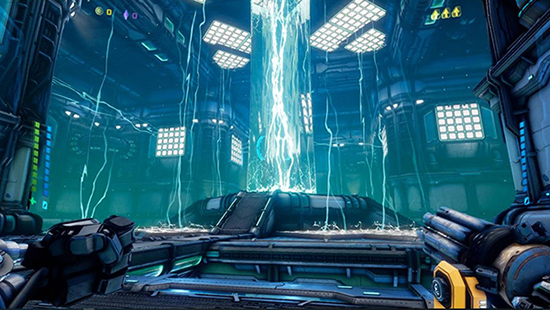 Find a new Energy Fountain and show your foes the power of unlimited Ammo! Find yourself needing more guns? The New Patented Item and Part Emitter (P.I.P.E. Mail) Delivery System lets you summon gun parts from the HQ… for a price! Feeling lucky? Roll the dice with the Mystery Shops! Perhaps you’ll score a Legendary Gun Part! Miniboss Fights! Think you were getting out of that ship that easily? Also, new loot alcoves, new Timer Rooms, new special gun parts, new electric hazards, new ways to die in Dice Roll rooms, a lot of new rooms of the other ship types, 3 new music tracks to enjoy, a whole heap of bug fixes, optimizations, and adjustments, and a whole lot more other stuff I can’t recall right now because it’s 1am and I told Tom I’d send this to him tonight.